Devon Smith continued his outstanding season for the Bombers with 23 disposals, 10 contested possessions, five tackles, six clearances and three goals. Jack Redden tried hard in a losing effort, finishing with 26 disposals, 12 contested possessions, four tackles, four clearances and a matchhigh 528 metres gained. In the second half, West Coast has dominated the inside 50s 36 to 17 and the tackles 30 to 16, but it was too little, too late unfortunately. The Eagles will be disappointed that they only outscored Essendon 5.10.40 to 4.4.28 from this dominance. 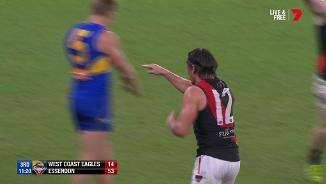 Essendon will be pleased that they have won the clearances 37 to 31 and have broken even in scores from stoppages with West Coast, kicking 2.5.17 to 2.4.16 from this source. Adam Saad has had 25 disposals at 92 per cent efficiency, his highest disposal tally as a Bomber. Saad's 25 disposals is also just one away from his career best 26 disposals recorded on two occasions in 2015 when he played for Gold Coast. Essendon has kicked 6.6.42 from chains originating in the midfield zone, where as West Coast has kicked just 1.7.13 from midfield chains. In the last two weeks, West Coast has kicked 10 goals and 26 behinds, a scoring accuracy of just 28 per cent. Essendon has had the advantage in contested possession all night, leading 116 to 99 in this area. Zach Merrett has had a fantastic game for the Bombers with 24 disposals, 10 contested possessions, four clearances and four tackles. 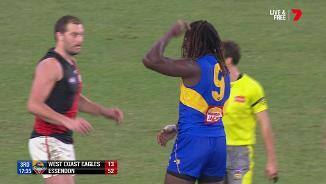 Essendon has outscored West Coast 5.6.36 to 2.8.20 from forward half chains. West Coast has failed to kick a goal from an intercept tonight, kicking 0.9.9 for the match. The Eagles average 63 points per game from this source, ranked third in the competition, with their previous low this season being 41 points from this source. West Coast will be disappointed that they haven't kicked more than just 1.5.11 to 1.1.7 from a 17 to six advantage in inside 50s this quarter. The Eagles have enjoyed 72 per cent time in forward half this quarter. From Rounds 1 to 11 with Jack Darling in the side, the Eagles kicked a goal from 28 per cent of its forward 50 entries. Last week and this week has seen West Coast kick nine goals from 99 entries, a strike rate of just nine per cent. West Coast and Essendon are deadlocked at 34 inside 50s apiece, but the Bombers have been far more effective kicking nine goals to one from its forward 50 entries. Essendon averages 47 points per game from intercepts this season, ranked 13th in the competition. Tonight they have outscored the Eagles 7.2.44 to 0.6.6 from this score source. West Coast is using the ball better by foot this quarter going at 75 per cent by foot, compared to Essendon's 67 per cent. Unfortunately two of the Eagles' three ineffective kicks for the term have been its two scoring shots. 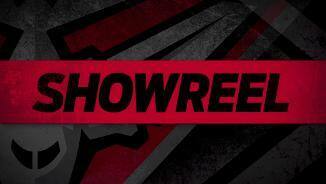 Essendon has comprehensively won contested possession 78 to 62 in the first half. It has been a team effort across the ground with 10 players having won five or more contested possessions for the match. Tom Bellchambers has given the Essendon midfield great service. 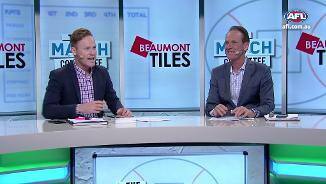 While West Coast leads the hitouts 27 to 19, Bellchambers has nine hitoutsto-advatage compared to the West Coast pair of Naitanui and Lycett who have six between them. Essendon has accumulated 65 more disposals for the match and have enjoyed four and a half more minutes time in possession than the Eagles. West Coast has had 12 of the last 14 inside 50s for the match over the last 10 minutes of game time, but have scored 1.5.11 to 0.1.1 over the time period. West Coast ranks fourth in the AFL for clearance differential and scores seven points per game more than its opposition from stoppages, ranked third, but are being outpointed 22 to 10 in clearances for the match tonight. The Bombers have picked up where they left off in the opening quarter, leading West Coast 12 to six in contested possession, six to one in clearances and five to one in inside 50s for the term. Five of Essendon's six goals came via intercepts. The Bombers had 12 midfield intercepts in total, resulting in six inside 50s and three goals. It was complete dominance from Essendon in the first term. 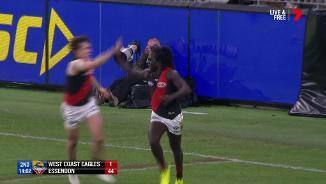 The Bombers won contested possession by seven, uncontested possession by 31, clearances by four, inside 50s by eight and tackles by nine while going five per cent better than the Eagles by foot. Adam Saad provided a lot of drive off Essendon's halfback line with eight disposals in the opening term at 100 per cent efficiency. Saad's run and carry broke the game apart, with his four running bounces and 227 metres gained both game-high's. 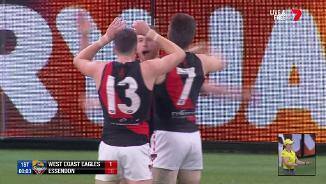 Jake Stringer has three of Essendon's five goals, marking just the second time that a Bomber has kicked three goals in a quarter this season. Shaun McKernan was the other Bomber to achieve this feat in the 1st quarter against Geelong in Round 9. The Bombers are well on top in uncontested possession, leading 44 to 22 and are also using the ball far better by foot, kicking at an efficiency of 76 per cent to West Coast's 65 per cent. Essendon has eight of the first 10 inside 50s of the match and have enjoyed 80 per cent time in forward half. This has been a fantastic start for Essendon against the best first quarter side in the competition. The Eagles have won 10 out of 12 first quarters this year, more than any other side. Prior to tonight, the Bombers had won seven of 12 first quarters. The Bombers have four scores from four inside 50 entries, a strike rate of 100 per cent. This season, Essendon ranks just 11th in this area, averaging a score from 43 per cent of forward 50 entries. Mitch Brown has two marks inside forward 50 already. 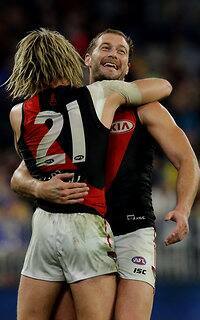 The Bombers average 12 marks per game inside 50, ranked fifth in the competition. The Bombers have averaged 26 points per game from their defensive half intercepts, ranked fourth in the competition. West Coast has scored 61 points directly from Elliot Yeo's forward half intercepts this season, ranked No.1 in the competition. Adam Saad has recorded 42 running bounces for the Bombers this season, ranked No.1 in the competition and 14 more than the next best player. 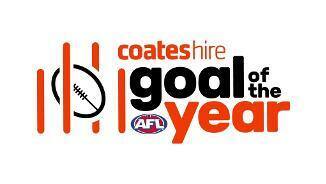 West Coast has scored a goal from 26 per cent of its inside 50 entries this season, ranked No.1 in the competition. Welcome to Optus Stadium for the West Coast Eagles v Essendon Round 14 clash. 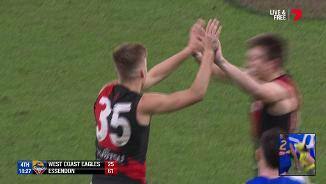 ESSENDON recruit Jake Stringer has unleashed some early carnage to help lift the Bombers to a shock 28-point win over West Coast. The Bombers booted the first eight goals of the Thursday night Optus Stadium match on the way to a 12.8 (80) to 6.16 (52) victory in front of 51,409 fans. Stringer booted three goals in the opening term, and although he failed to add to that tally after quarter-time, West Coast's wobbles in front of goal ensured Essendon secured the win despite ending the match with two fewer scoring shots. 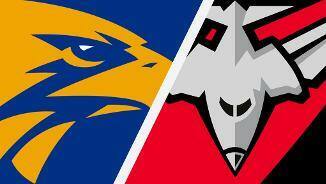 Essendon (6-7) has now won four of its past five matches, while West Coast (10-3) has lost two straight. The Eagles entered the match without their best two forwards after Josh Kennedy (leg) joined Jack Darling (ankle) on the sidelines. 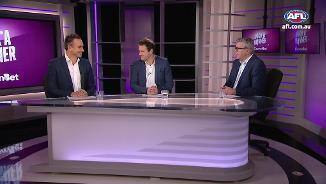 But it was in the midfield where the Eagles copped a first-half caning, especially in the opening term when Essendon booted six goals to nil. The Eagles entered the first break with a solitary behind to their name - their lowest ever quarter-time score in Perth. And when Anthony McDonald-Tipungwuti snapped a clever goal from the pocket early in the second term, the scoreboard read 50-1. While the inaccurate Eagles clawed back into the contest, the damage was done. 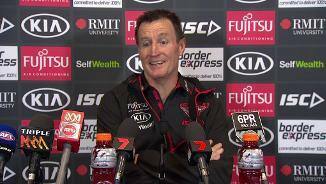 "Every win is always enjoyable, obviously," Bombers coach John Worsfold said post-match. "That was a tough game, but overall we're obviously pleased we took the opportunities early when we had them and just kept that pressure on all night. "I thought our ball movement going forward was really dangerous early (with) good decision-making. "It gave us a great buffer to start with." 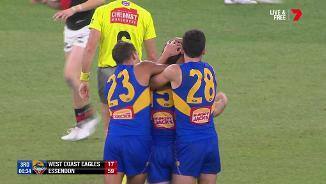 Nic Naitanui scored West Coast's first goal at the 11-minute mark of the second quarter, but the Eagles fluffed a series of other opportunities during the remainder of the half. Nevertheless, the Eagles had at least stopped the bleeding, with the home side entering the long break with some momentum. The lead was still a daunting 40 points at that stage and West Coast sprayed even more shots in the third quarter. 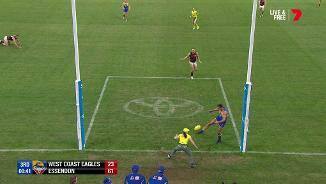 The Eagles' plight was best summed up by ruckman Scott Lycett, who should have soccered through a goal from about 40cm out but missed the ball completely. A fresh airy for Scott Lycett! Trailing by 37 points, West Coast rolled the dice in the final term by moving Jeremy McGovern forward. But the game was effectively put to bed early in the final quarter when Matt Guelfi's long-range bomb took a lucky bounce and rolled through for a goal. West Coast won the inside 50s 59-45 but lost the clearances (39-33) and contested possessions (143-126). "The start was really poor by us. Really good by Essendon. 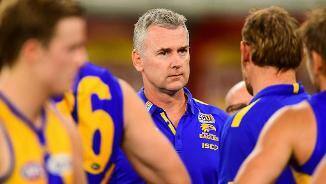 We couldn't stop their rebounding defenders – nothing to do with personnel," Eagles coach Adam Simpson said. "We just couldn’t win the contest in midfield the way we wanted to and they broke tackles and broke lines, which gave them goalside opportunities. "They were too tough for us in the first quarter, which is really disappointing for us. "The rest of the game we played better and then the goalkicking and the missed opportunities kicked in. 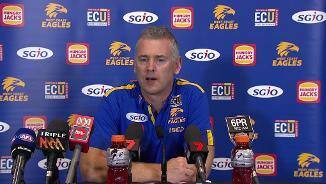 "But the damage was done in the first quarter so we'll reflect heavily on that." West Coast: The Eagles appeared to get through unscathed, in about the only thing that went right for them on a disastrous evening. Essendon: Small forward Josh Green limped from the ground early in the second term but returned shortly after. Mason Redman was on crutches post-game after hurting his ankle late in the match but how much damage he has done is unclear. 20 disposals and three goals for Devon Smith! The Eagles travel to face the Crows at Adelaide Oval, where they have won on six of their seven visits, while Essendon returns to Etihad Stadium and hosts co-tenant North Melbourne in another crunch encounter.